When I last wrote 3 months ago, I anticipated that I would have to review some of my holdings in my RRP and IFL portfolios. This is forced by the inevitable imported post-Brexit inflation making it more difficult for my shares to continue to raise their dividends by more than inflation, as they have so spectacularly done since I launched the two portfolios. I anticipated that the main problem would be with the more recently launched Income for Life portfolio, because I initially had to settle for some higher yielding shares with lower growth prospects in order to achieve my rather demanding starting income target. I had grown used to just periodically updating the original Rising Income Retirement Portfolio (RIRP) and complacently reporting that most companies had increased their payouts by two or three times the (undemandingly low) rate of inflation, and so conveniently compensating for any temporary laggards. After all, the portfolio was specifically constructed so as to be a low maintenance selection of shares, designed essentially to look after itself, as insurance against the day when I may have lost those marbles still remaining to me, rendering me less able to take financial decisions. So it was a shock to me as I updated the table below to discover that whereas seven of my companies had already announced dividend increases for the accounting year ahead averaging over 11%, shown in bold in the last column of the table, Interserve had spoiled the party by “suspending” its forthcoming payout. Only recently I had been heralding it as one of my star performers, only one of three in the portfolio to be delivering the coveted double figure yield on the original sums invested. This is where my professed indifference to the capital value of my shares may have let me down. For as Interserve’s dividends had risen since I first bought the shares, so the capital value had climbed to more than 3 times my original purchase price by 2014. This is what I would expect. But what I had not appreciated was the steady fall in the share price from its peak, despite continuing rises in the payout – up nearly 5 per cent last year. Now it is marginally less than we paid for it, and we know the reason why: not only are underlying profits down, but exceptional costs in getting out of its Energy From Waste business has resulted in a £160m exceptional charge, and the need for new banking facilities to see it through the painful transition. The passed dividend will “only” save some £23m, so I anticipate the dividend “suspension” may be rather like Norman Lamont’s suspension of the UK’s membership of the European Monetary system back in 1992. Since I cannot see how the pound’s post Brexit decline can fail to feed through to anything less than price rises of 5% before much longer, I need to undertake some drastic surgery to protect my future income flows in the RIRP. Because Interserve’s cumulative dividend growth had been so good, it leaves a £600+ hole in the coming year’s income, assuming the dividend “suspension” lasts the whole year, and not just the final which should have been paid next month. Before this I had decided the portfolio was strong enough to ride out both the projected further dividend cuts at GLIF, partly because I have little appetite for crystallising the resulting large capital losses, but also because I still have some hope that it – like Lloyds and RSA – might eventually come good. And because I suspect that may happen before Interserve resumes its former payouts, I still think that makes sense. So I think it makes sense to take a small capital loss on the Interserve shares by selling them all. To pay for this, and also to compensate for the inevitable short-term dividend reduction resulting from my reinvestment decisions, I will also sell two fifths of my holding in Reckitt Benckiser, whose shares are currently up around 50%. In some ways this is a painful choice, since this dollar-earner has just announced a dividend increase of 10% which may well be exceeded for the full year, but in terms of its current share price it is only yielding just over 2%, and in the short term I can put both the capital and the capital gain to better use. 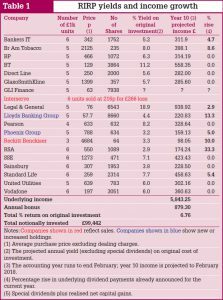 My sale of Interserve and the RB shares generates cash of around £8,836 from investments originally costing around £8,000. 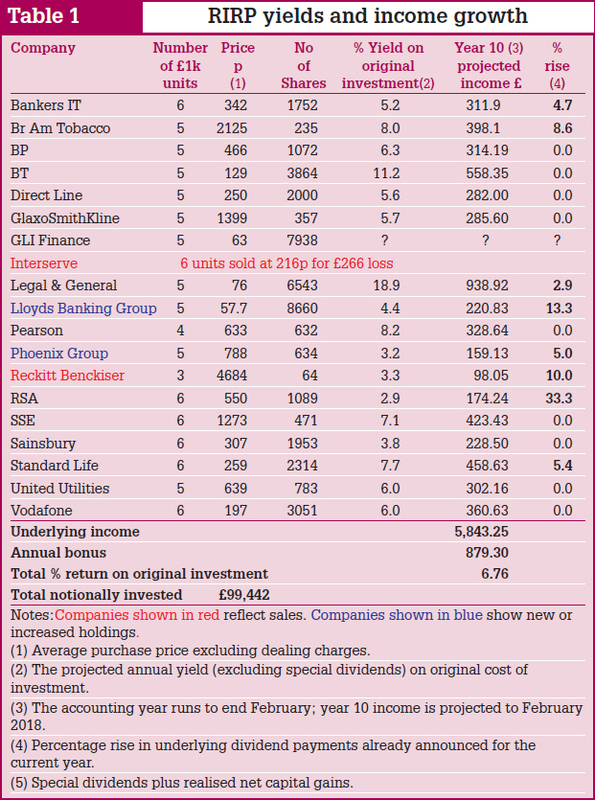 So I am going to add the net capital gains of £836 to the £43.30 already sitting in this year’s annual “bonus” account as a result of Lloyds Banking Group’s latest special dividend payable, and use £3,000 to top up my below-average holding in Lloyds to the standard 5 units, since I now anticipate continuing above average dividend increases as the company recovers from its near-bankruptcy after the HBOS takeover. (I am assuming the latest legacy liability regarding illegal actions by rogue staff will be negligible in the context of the costs of PPI misselling). This latest purchase means a big rise in the average price we have paid per share, and though the apparent yield is still below the portfolio average, the latest special dividend to be paid in May brings the actual return to over 5.25% with every expectation of further growth. In place of Interserve I am investing the remaining £5,000 “original” capital into Phoenix Group. Formerly Pearl Assurance, this company really has reinvented itself, moving to the Cayman Islands and developing an eagle eye for making money out of other companies’ zombie life funds – those closed to new business but whose liabilities can be run down very profitably. Although the current dividend is technically not covered by earnings, the group is actually throwing off cash at an impressive rate, and the board is confidently forecasting a further overall 5% increase for the year. The City gossip is that it may relocate its domicile from the Cayman Islands to facilitate fundraising for more acquisitions. I am buying this share (as I have recently bought for myself) even though the portfolio will miss the xd date for the May dividend, and so will only deliver half the full year’s anticipated 6.4% yield in our accounting period. The short term effect this year will be that based on dividend increases for the year ahead declared so far, the portfolio’s underlying income will fall from £6,325 to £5,843. I expect this gap to have narrowed substantially over the remaining 10 months of the accounting period as more companies announce further increases, but meanwhile I have no compunction in including the “bonus” income in the yield calculations. Just as I have always claimed that unrealised capital profits do not pay the grocery bills, so the corollary is true that realised profits can do. If we choose to deplete the whole of this year’s current war chest, our disposable income will be more than 6% up for the year ahead, way above any anticipated inflation rate. The expectation of further announcements of higher dividends over the coming 10 months mean there should be no need to crystallise any further capital profits, unless an exceptional reinvestment opportunity arises; barring another Interserve of course. I am leaving the IFL alone for this issue as there are no horrors other than the known question mark over GLIF’s future dividends, though several other shares are showing little or no growth, problems I shall address in the July issue. First published in The IRS Report on 1st April 2017. Articles are listed chronologically, and show the original publication date.